I look forward to the Spring every year. The snow starts to melt, flowers bloom and the daylight lasts longer. It also means it’s time to purge! As someone who can’t stand clutter, I look forward to a big clean-up and get the entire family on board. Out with the old, in with the new, as they say! Though I keep a donation box year round, this time of year I like to go through everything. I organize the closets and set aside clothes that no longer fit or that are never worn. I also like to clean out my kitchen cupboards. I always feel a little lighter when I’m done. John is a bit of a pack-rat so it can be a struggle to get him to release some of his belongings. I shake my head at some of the stuff he keeps, but as long as it’s organized, I can live with it. And he has done well in the past year or so in getting rid of things. Once you’ve collected all the stuff you don’t want to keep, you have a few options. You can wait for Spring Garbage pick-up in your community and throw it away. Drive it to the local dump. A better option is to donate the usable items to a charity. This is what I plan to do. Since moving to Pembroke in June, I’ve donated several times to our local Value Village. However, there are many other spots where you can donate your gently-used clothing and other household items. I’ve listed six spots in Ontario that accept donations. 1. Salvation Army Thrift Stores: Accepts gently-used clothing, shoes, used electronics, bric-a-brac, and a wide assortment of everyday household items directly in-store during store hours. 2. Goodwill: Check out this list of what they accept (and do not accept) as donations. Find a Goodwill Donation Centre near you. 3. The Kidney Foundation of Canada: Donate your gently-used clothing. You can either schedule a pick-up or bring the clothes to your local donation box. 4. 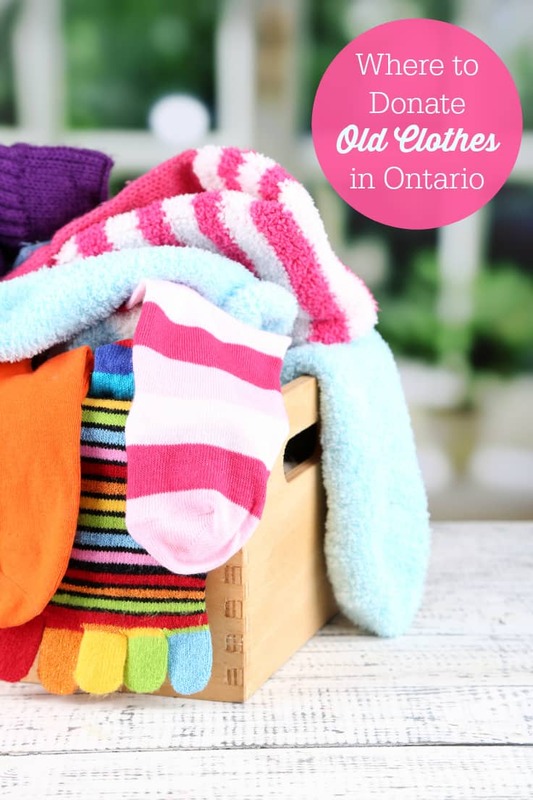 Ontario Federation for Cerebral Palsy: Accepts clothes, shoes, coats, bedding and linens. Contact them to set up a free home collection. 5. Canadian Diabetes Association: Accepts gently used clothing, bedding, blankets, footwear and more. Schedule a free pick up or drop off at your local location. 6. Value Village: Accepts good quality housewares, clothing, books, etc. I’ve got a box on the go right now and I imagine by the time I’m finished cleaning and organizing the house, it will be full. Where do you donate your old clothing (and other household goods) that you no longer need? Yes, I donate them; wither to the Catholic Woman’s League store or to the Diabetes Association. I donate to a local thrift store that is not-for-profit and gives back to the community. This year they donated money to our public school so the kids could have music class! I donate our used clothing to Goodwill and we always drop them off. I usually donate our old clothing. I donate them to the Canadian Diabetes Assoc. It is so easy as they have red bins in the Safeway parking lot and you can just put your bags in it. I donate clothes to the Salvation Army and to the homeless! We donate ours to a local clothing donation center for those who are need right in our town. I donate my clothes online to ppl in need. There is a group on facebook that I am on and everything in my home from clothes to dishes, i put on that site and someone grabs it.